A plastic iguana tail wrapped around a bottle with a blurred background. Doesn’t get much more artistic than that. First off it’s Winter. Secondly, you should be drinking water if you’re sweating that much. Finally, today’s soda review isn’t just for Coca-Cola, it’s for Coca-Cola Georgia Peach. I’m not even sure you can currently find this in stores, but I didn’t review it when I picked it up this past Summer. It should still be good, but perhaps I should work on my timeliness. You may be saying to yourself, “Haven’t I already read the Coca-Cola Peach review? Quite possibly yes you have. That review was for Coca-Cola Peach though, a Japanese soda. This one is for Coca-Cola Georgia Peach… an American soda. So buckle down for fifteen sentences filled with words. Smells like Coke and real deal peaches. Let’s move on. First off the peach taste in this is surprisingly solid. It’s the first flavor to hit my lips and it’s oh so smooth. 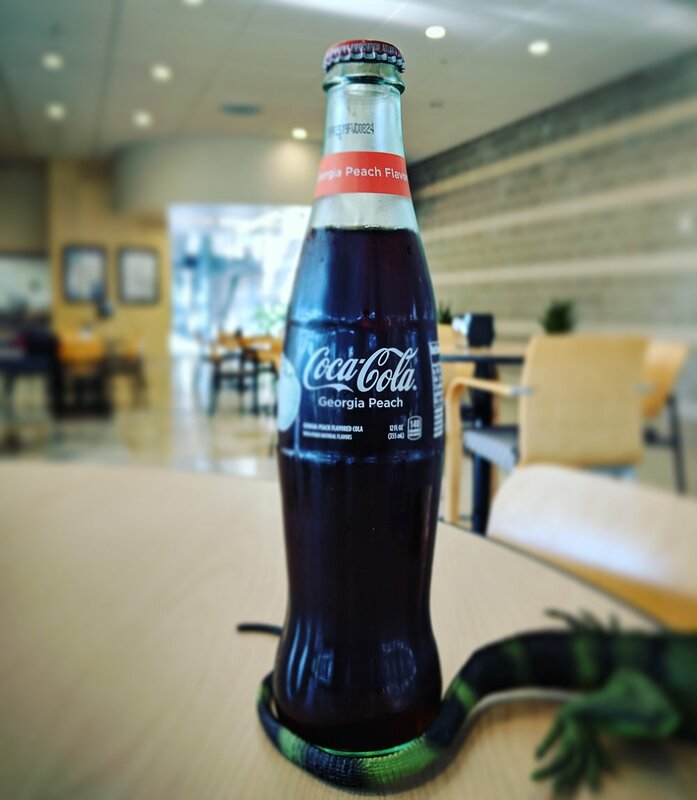 Any lingering nectar-like flavor is cut short by the sharp bite of the Coca-Cola. It’s abrupt, but works well in terms of mouth feel. The bubbles graze the back of my throat, causing a tingling sensation with a very slight burn. The aftertaste represents each flavor equally well, and causes me no issue. I like this soda. One thing I found surprising was the fact that the taste isn’t a “candy” peach flavoring. It appears Coke opted for the more natural taste and I think they made the right choice. Oddly enough this is a rare opportunity where I’ve actually tasted what the “candy” peach version of this soda would be and I prefer the Georgia Peach. Aside from that one hang-up this is a delightful soda that I can easily recommend… that is if it’s still in stores. If not, you missed a good one and hopefully it returns.